Negotiating should not be a battle, as it is truly an art. 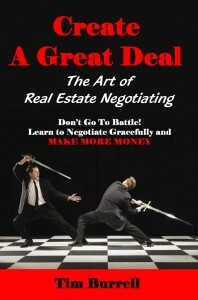 You can learn to artfully create more deals, and better deals, by reading Create a Great Deal. This book focuses only on real estate negotiating, the kind that real estate agents and investors have to learn to succeed. The most difficult part about a real estate sale is occasionally the other agent or the other party. Yes, there are difficult customers, stressful situations and sudden problems. But, if you and the other parties can negotiate well together, the experience can be professional, occasionally choreographed like a smooth dance. If you and the others cannot mesh, it gets ugly. This book teaches you to treat the other side as a counterpart instead of an opponent. You learn to work together to reach the common goal of buying and selling a property, instead of the battle that you now endure. When you let everyone involved feel like they have won, you get a sale that closes more gracefully, as well as customers and other agents who want to work with you again. Since there are less buyers, every sale counts. You need to get the deal signed and complete the sale every opportunity you get. It does not look like the number of sales will increase soon, so stop missing sales from negotiating mistakes. Tricks you need to recognize so they cannot be used against you. This book is 238 pages of in depth analysis of real estate negotiating in a manner that has never been done before. You will get an understanding of all the terms and concepts used in real estate negotiating of every type, for every market. Designed specifically for agents and professional real estate negotiators, you get a step by step guide of how to represent buyers, sellers and yourself in all the situations you can face in the real estate business. To order Create A Great Deal, the Art of Real Estate Negotiating for $19.95 plus tax and the cost of shipping, click on the button below. Please remember to include your mailing address so we can send it right out. To order both books, Create A Great Deal, the Art of Real Estate Negotiating and Create a Short Sale, Your Guide Through the Short Sale Maze, at a 10% discount for $34.11 plus tax and the cost of shipping, click on the button below. Please remember to fill in your mailing address so we can send it right out.